Carolyn DeFord, a Puyallup tribal member, grew up with her mom, Leona Kinsey, in a trailer park in La Grande, Oregon. Twenty years ago, Leona disappeared on her way to her friend’s house, and was never seen again. 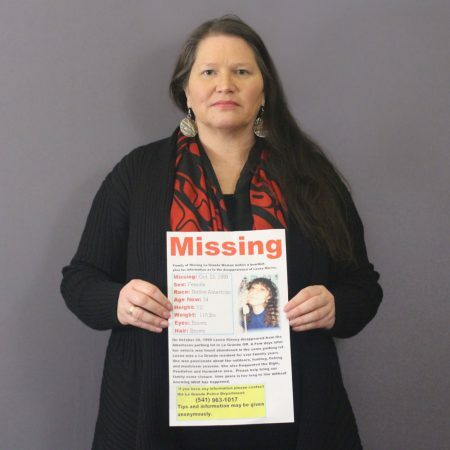 She is part of an epidemic of Native American women who have gone missing and never been found. No one knows exactly how many Native women are missing or murdered, though a report put out by the Urban Indian Health Institute in 2017 cited 5,712 reports of slain or missing Native American women and girls by the National Crime Information Center. Only 116 of those cases were logged into the Department of Justice database for missing persons. Carolyn came to StoryCorps to remember when she received the phone call that her mother had gone missing. Leona’s case has never been solved. Since her mother’s disappearance, Carolyn has worked to help the families of other missing and murdered indigenous women. As heard on NPR Morning Edition.